A new season calls for a new range of hair products. Well somewhat new. 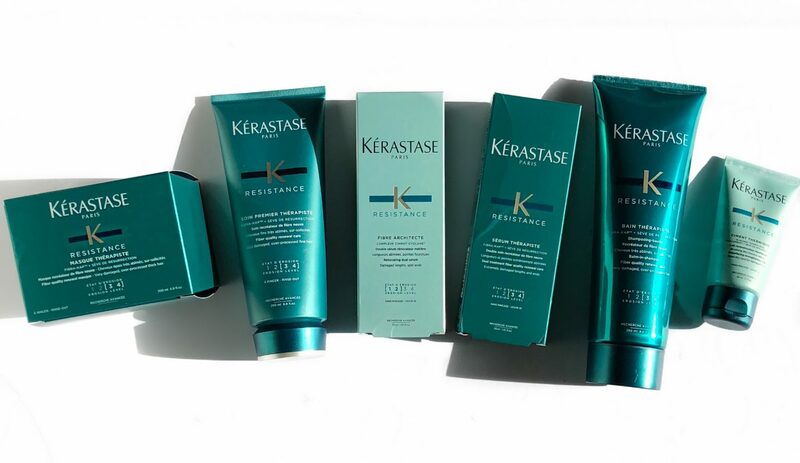 As of late, I’ve started re-using the Kerastase Resistance line. I took a little break because I was primarily using hair products intended for colour treated hair; to keep the colour fresh. I still am. However, now I’m alternating every few washes. It’s a line intended to revitalize damaged hair back to a healthier state. I regularly switch out my shampoos, conditioners and hair treatments every couple of months. Sometimes even sooner, if I’m not seeing results relevant to my current hair health. 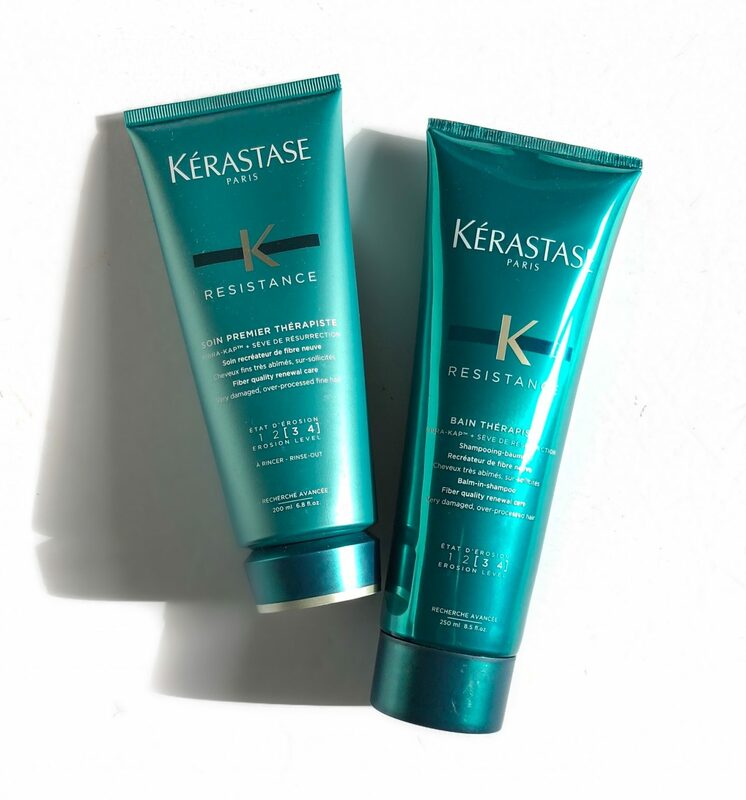 So if you’re interested in reading my thoughts on the Kerastase Resistance Range, keep reading!The effects of consistent sun exposure, through the Summer months, combined with coloured hair, definitely shows during the colder months. The very instant I know warmer weather is around the corner, I jump on board for lighter coloured hair. Then I spend the entire Winter trying to revive my hair back to health. Before I continue, for those new to my blog, welcome! 🙂 Here is some insight into my hair type, in case you have similar concerns. I have fairly long (down my back in length) hair. Naturally, my hair is frizzy/wavy (likely from becoming denatured, from the years of colour treatments and hot tools). 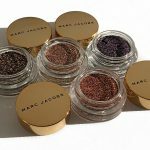 *You obviously don’t have to use the entire range to reap the benefits, but here are which ones I use, and how often I use them. The first product is the Soin Premier Resistance Pre-Shampoo $48 CAD, which promotes pre-conditioning the hair. As it’s designed for damaged and over processed, fine hair. It’s primary goal is to prevent further damage. As wet hair is incredibly frail. 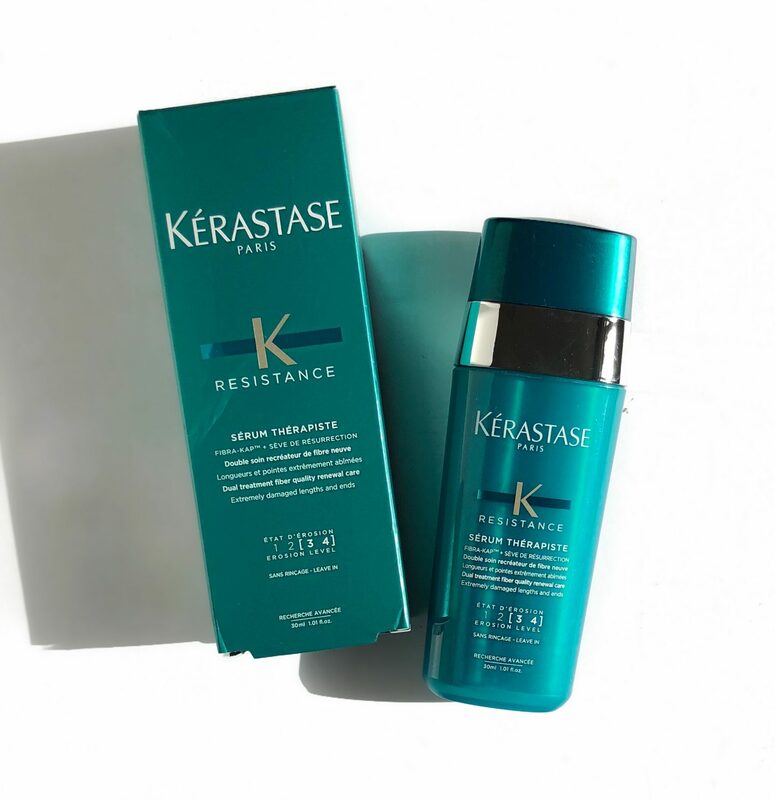 The Resistance line from Kérastase consists of a handful of products, catering to the hair needs of both moderately damaged and severely damaged hair. We’ve all heard the term ‘reverse shampooing’. Where you condition your hair first and then go in with your shampoo. 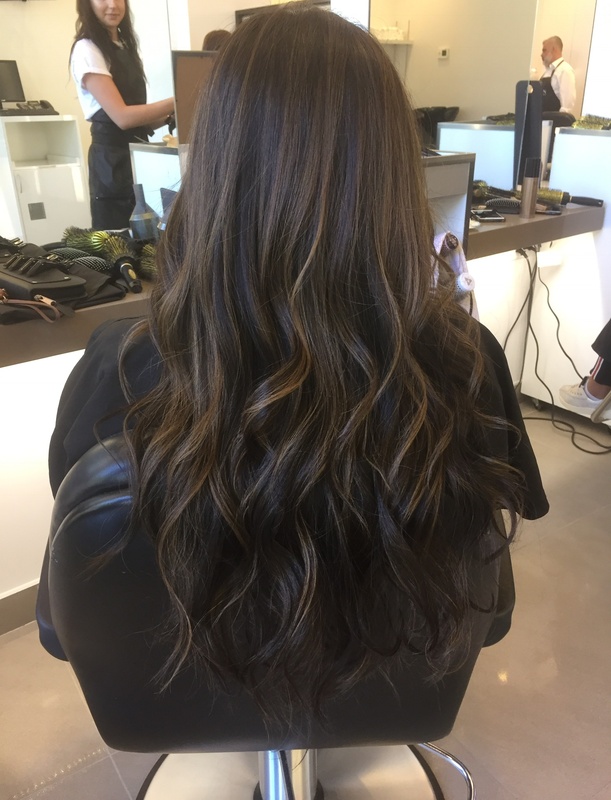 People with pretty much any hair type can benefit from this technique but individuals like myself with drier or damaged locks, will definitely notice a greater difference. Next, I follow up with the Bain Therapiste – Balm in Shampoo $45 CAD. 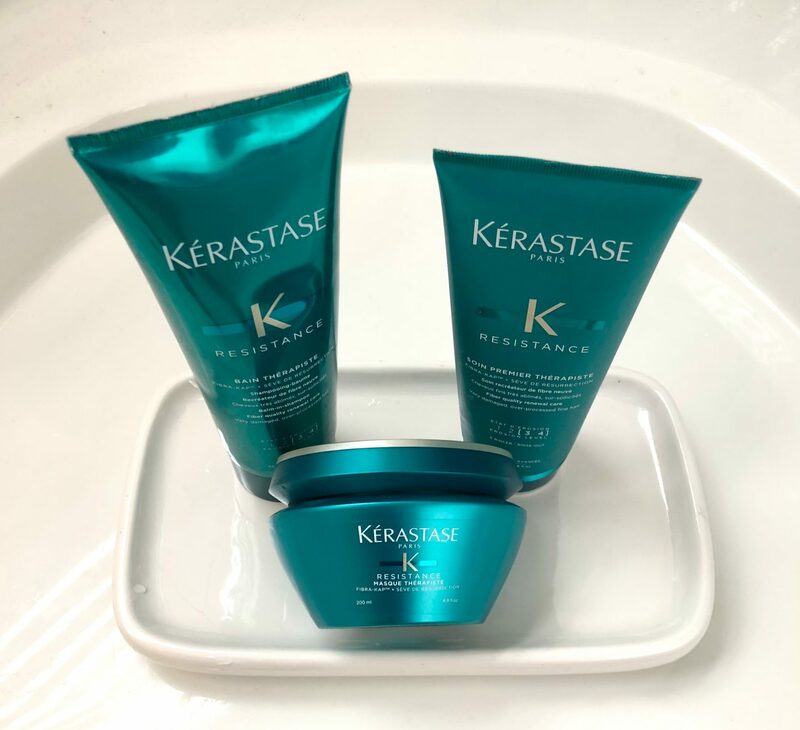 This is slightly on the heavier end in terms of consistency or maybe I’m just used to Kerastase’s clear, liquid-form Shampoos. My scalp felt clean without feeling like it was stripped of all its moisture. My hair was pretty much detangled. Which I can thank the reverse shampooing technique for! Bain Therapiste has a heavenly floral fragrance that I wish would never leave! This next product is one I would ideally like to use at least twice a week but because long showers a luxury when you’re pressed on time. 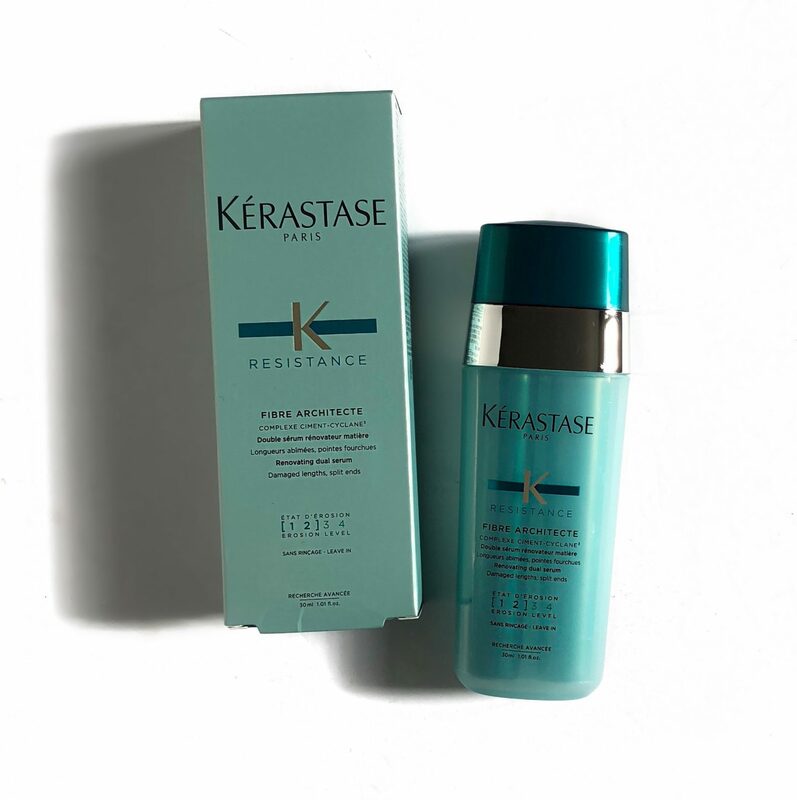 I try to use the Kérastase Resistance Maskeratine $65 CAD at least once a week. Rich and creamy, this will change your hairs’ life! I leave it on for 5 minutes and rinse. I have noticed an incredible difference in the texture of my hair, post-mask. The lengths of my hair are smoothed. This is probably the one step I give credit to, that makes my hair so soft! Moving on to next product in the hair care system. the Serum Therapiste $57 CAD is available in two versions, depending on the level of erosion level. The Serum Therapiste combines two products into one. It is an oil based serum, which helps to revitalize the hair. As well as a cream, to help with the overall texture and seal the ends of my hair. I apply a small amount on to my towel dried hair, mainly working it into the hair shaft and avoiding the roots. I currently use the Serum Therapiste erosion level 3-4. If you have colour treated hair, that required bleaching to achieve that colour. Then at one point or another your hair may have have that ‘crisp’ feel. Where it’s not bouncing with volume but rather sitting stiff. The Serum Therapiste has helped add REAL moisture back into my hair. By that I mean, moisture that doesn’t disappear in-between washes. Instead my hair feels like it’s continuously improving from its last state. Plus with the cooler weather, it’s a preventative measure to combat the effects of dry, crisp air on the hair. Moving on to the heat-protectant product of the range, the Ciment Thermique – Blowdry care for damaged hair $24 CAD. Is said to ‘strengthen and fortify hair fibers from within’ and ‘helps protect hair from heat styling processes’. Ciment Thermique’s Vita-Ciment TopSeal, coats the hair, protecting it from factors such as hot tools. This is a leave in treatment, so it should be left as the last step. Ideally you want to apply this throughout your entire head of hair. However, to prevent my hair from being weighed down, I apply it 5 inches away from my roots. 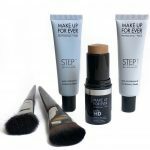 This is the one product I wish was in a different formula/format. As I use a heat protectant every time I heat style my hair, so I would’ve preferred a spray. 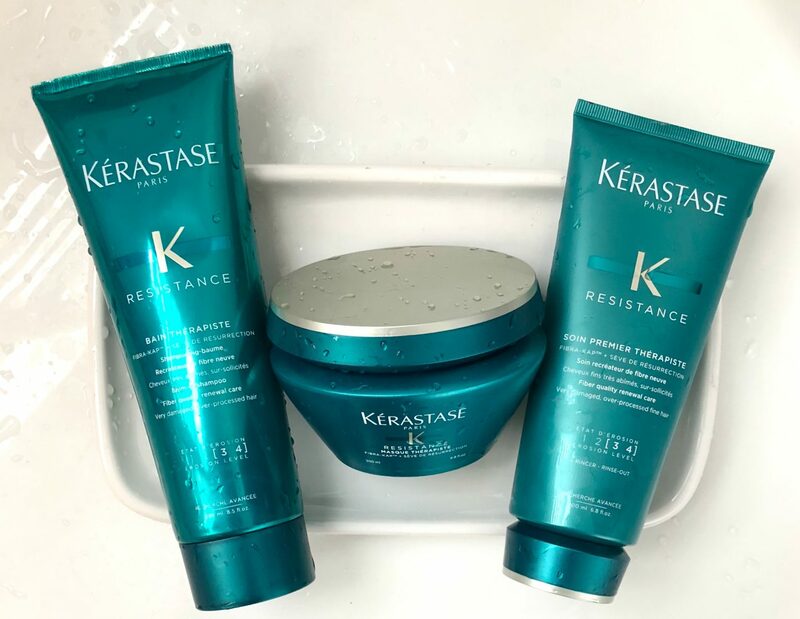 All in all, I really recommend checking out the Kerastase Resistance Range if you have damaged hair and are looking to get your hair back to a healthier, shinier state. If you’re unsure whether it’ll work for you or if it’s worth the purchase. 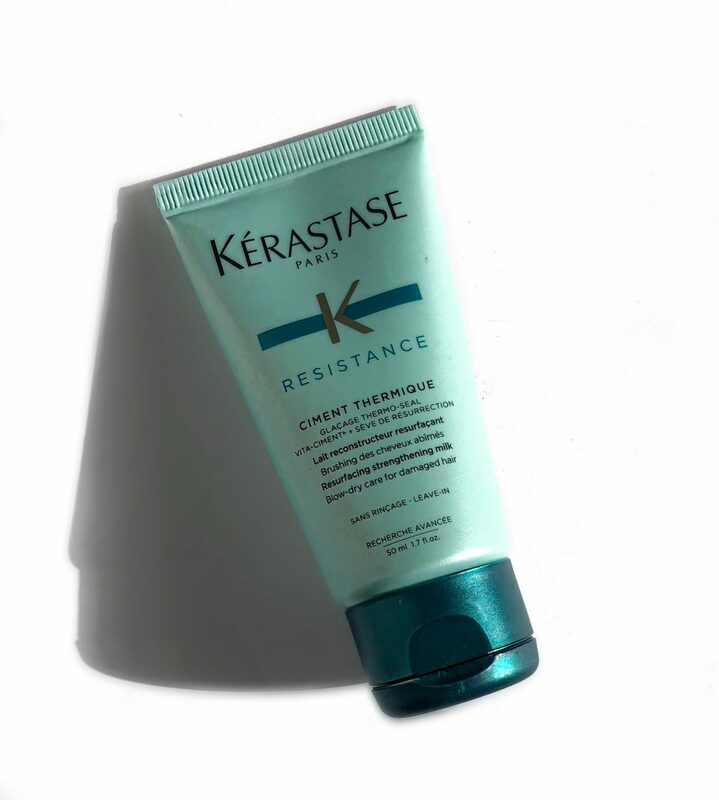 I recommend trying out the Bain Therapiste and Kérastase Resistance Maskeratine first to get a feel for the products. 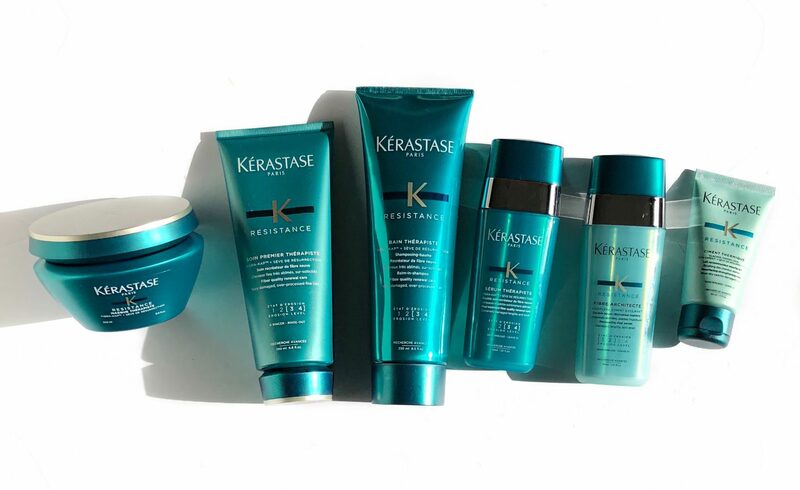 You can get your hands on the above mentioned Kérastase Resistance Range products online at kerastase.ca and now conveniently at SEPHORA! How exciting!